I would like you all to believe that we did what we did because we were so wrapped up in each other that we could think of nothing else. I would like you all to think that we did what we did because we were very engrossed in stimulating conversation and got carried away. But the plain truth is that we did what we did because we were absent-minded. At the very least, I hope that the waiter and the cashier believed us when we told him that we walked away without paying the bill not because we wanted a free meal, but because we actually forgot about the bill. If I ever have to list my most embarrassing moments ever, this one would top that list. The one where the husband and I had a hearty breakfast at one of our favourite cafes, tossed the napkins over our empty plates, got up and left. Neither of us realised that there was a bill to be paid! The next part repeats itself in slow motion: the waiter running behind us and shouting "Excuse me sir, your bill....you didn't pay the bill." Everyone else in the restaurant stopped eating and we could feel several eyes trained on us. Can you imagine the embarrassment? Of course, we tried to brush it off with some laughter but once we stepped out, I swore I would never return to the restaurant again. No matter that I loved coconut pancakes there and frequented the restaurant mainly for those pancakes. Of course, what you cannot go out and eat, you make at home. And make it well, so that you never ever need to go out and eat it at any restaurant again! Sift both the flours, salt and the baking powder in a bowl. Stir in the sugar and the grated coconut. Beat the egg and whisk it with the coconut milk and oil. Add this to the dry ingredients and beat to get a smooth batter. Let the batter stand for 10 minutes. Meanwhile, make the passion fruit and mango coulis. Scoop out the pulp from the passion fruit, mix it into the mango juice and bring to a boil. Add the cornflour and stir it starts to thicken. Pour a couple of ladles on a greased and heated non stick frying pan. Cook for a couple of minutes; when bubbles start to form on the top , flip over and cook for a further 2 minutes or until golden brown. Before serving, slice the banana, toss it in the brown sugar and fry it till the sugar just starts to caramelise. 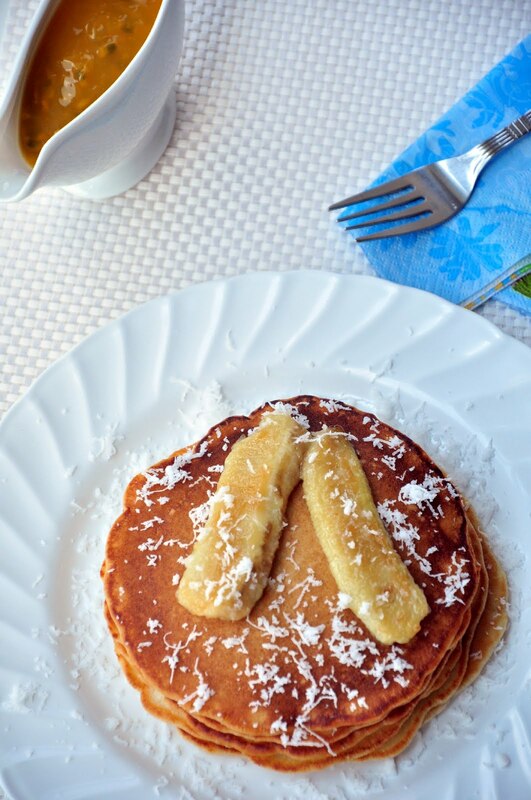 Serve the pancakes with some passion fruit - mango coulis or caramelised banana; I preferred them with the bananas. I prefer my pancakes on the thinner side; this recipe makes 8 pancakes. 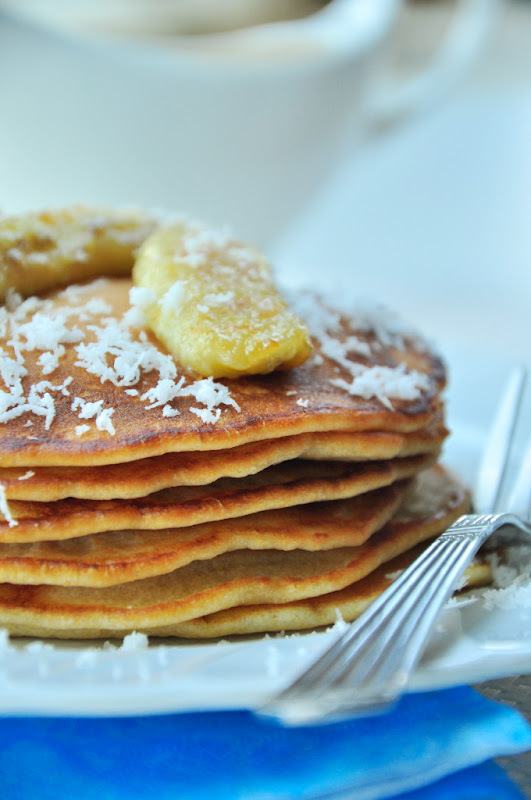 I am a pancake fan and love your version of coconut in it. Shall be making them this weekend. Like the Passion fruit and mango combo for topping. 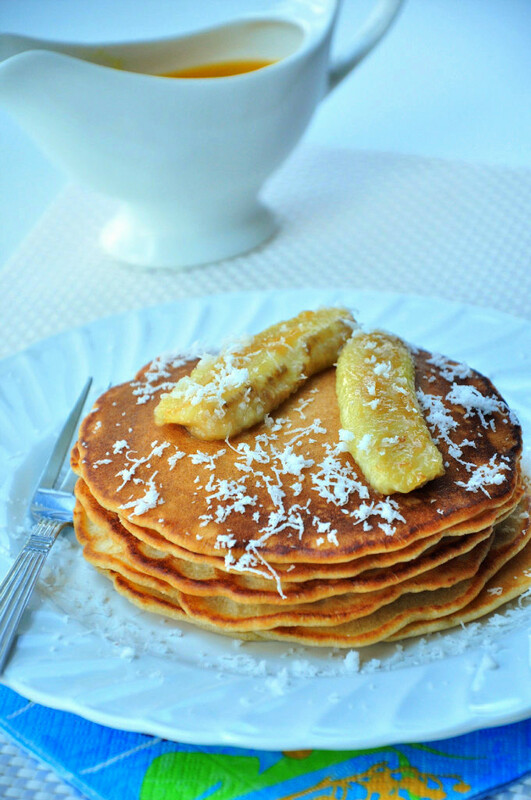 Cant say no to coconut in anything,those pancakes looks absolutely divine..
Wow so yummy and invitng pancakes..
how important is the whole wheat pastry flour? i have all the other ingredients on hand, so if it can be substituted for, i could actually make these tonight! These are beautiful, gorgeous and tasty looking pancakes! I think I'm going to have to try them out this Saturday! Hey thank you all for being so supportive at our faux pas! On hindsight, I agree, it sounds very funny, but on that day, it was embarrassing! Georgina, you can use only all purpose flour (1.5 cups) if you don't have whole wheat flour. Hope you like the pancakes. It's probably not as unusual as you think, Aqua. Desi and I were once out drinking with a friend and at the end he kindly insisted on picking up the tab. He seemed surprised at how small the bill was, and paid it in cash. We weren't a few steps out of the restaurant when our server came huffing ad puffing behind us-- it seems our friend had paid for just one item on the bill: the entire tab was considerably larger :)It was an honest mistake, and I think one that all restaurants encounter at some time or the other. Splendid pancakes! Exotic and divine.